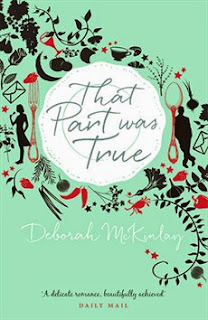 Book Drunk: Review ~ That Part Was True by Deborah McKinlay. Title: That Part Was True. Reminiscent of ONE DAY meets 84 CHARING CROSS ROAD, THAT PART WAS TRUE is a bittersweet story about falling in love and risking it all. That Part Was True is a charming little story, one which delicately explores the feeling of loneliness and how companionship and understanding can be found in the most unexpected of places. It all starts when Eve sends a letter to author Jackson, but they soon discover that they have much more to talk about than simply a scene in his book. They quickly connect, corresponding mostly about food and the art of cooking, veering gently into the more hidden parts of their personality. The art of their writing is moving but how would things turn out if they ever chose to meet? That Part Was True was told at quite a slow pace and as for actual events taking place, there wasn’t much that really happened in that aspect. But the progression in Eve and Jackson’s psychological states was where this book was really developed and part of its charm, delivered in a thought-provoking and engaging way. I loved the communication through letters, mostly between Eve and Jack, and would have liked to have seen more of them. Whether they were brief or more lengthy and personal, they were alluring and gorgeous to read. The written form of communication in letters is not used enough in fiction but I feel like, in this case especially, they’re so expressive and powerful to read – my favourite part of the novel. I was fascinated in the stories of both Eve and Jack, if not all that taken with either of them. I didn’t dislike them, not at all, but I also didn’t feel like I had much of an understanding as to why they were both in such a bad place. They were both facing challenges but nothing seemed that drastic to have caused them to feel so downbeat. Still, I did feel like I figured them out a bit more as the book went on and hoped for some newfound happiness for them individually. That Part Was True focuses a lot on love and relationships. There’s the familial love between Eve and her daughter Izzy, which seems to provide anything but the easy unconditional love expected of a typical mother and daughter relationship. Parenthood is explored through Izzy’s father Simon too, who has not lived up to the responsibility of being a dad at all, in the past. There’s a look at marriage, as Izzy and Ollie are engaged and planning for their future, but not without difficulty. Other than the connection between Eve and Jack, my favourite relationship was the friendship between Jack and Dex. Though not a major part in the novel, I loved Dex’s involvement. He brought a lighter, more humorous outlook to Jack’s life and in turn the story of this novel, making me smile when other characters were immersed in their own issues. I had an idea from the synopsis where this book would be taken but instead, I found the way things played out to be unpredictable. Towards the end, I was so interested in the lives of Jack and Eve that I didn’t even really consider that this book might finish on a completely different note to what I had thought. But I love it when an author can surprise you. I actually adored the ending. It was gorgeous to read and made me wonder about how far both characters had or hadn’t come throughout the novel. That Part Was True is a real reminder that life is not easy, but through your troubles, there’s always somebody out there who understands and who you can connect with, however close or far apart you may be. Cover is eye catching. Doesn't sound line a book for me. I trust your ratings. No it's not a bad rating.